Although not commonly known or mentioned, the powder post beetle represents one of seventy known species of wood-boring beetles. These small, reddish-brown insects are usually less than 1/4 inch in length and they are flat-bodied, which allows them to attack deciduous trees, both hardwoods and softwoods, depending on the species. They attack repeatedly, which over time reduces the wood to a powdery dust —hence their murky moniker. The wood dust they create is known as frass, and it is comprised of feces and the sawdust they leave behind. Hardwoods that have low starch content or very small diameters in which the female beetle cannot lay her eggs are immune from their devastation. Other woods, however, are highly susceptible. In fact, powder post beetles rank second only to termites in terms of the structural damage they cause to wood products such as beams in barns, cabins and homes; hardwood floors and cabinets in both homes and businesses; furniture and musical instruments. Infestations are usually found in newly manufactured edifices and homes, but can occur in just about any wooden structure, especially historical landmarks such as the covered bridges that sprinkle our beautiful country landscapes throughout Western Pennsylvania. Professional action by pest experts should only be taken if the infestation is active. These beetles are known to die out naturally. If it is an active invasion, which will be evidenced by new powder formations near the wood, professional pest control and pest management experts should be contacted immediately. Read on to learn more about this potentially destructive, wood-boring insect and the exacting methods we employ to prevent and exterminate infestations, or contact our team today with any preventative or immediate needs (412) 252-5200. There are three main types of powderpost beetles: lyctids, bostrichids and anobiids. All of them leave behind wood that is infused with pinholes. It is the larvae that that cause the damage, producing the fine wood powder as they bore through the wood. Their differences, which can be quickly ascertained by our pest control and pest management entomologists and technicians, concern the fact that lyctid powder feels like talc, bostricid more like cornmeal and anobiid powder has a grainy feel. Lyctid powder post beetles attack only wood products manufactured from hardwood (broad leaf) trees such as oak; ash; walnut; hickory; poplar or cherry. Infestations usually occur within flooring, paneling, molding, window and doorframes and furniture. Tropical hardwoods and bamboo are particularly vulnerable to infestation because of inferior storage practices often employed before importation. Bostrichids are less narrow-bodied and more flattened than lyctids. Their heads are pointed downward and give the appearance of being hooded. The female of this type of beetle bores directly into the wood in order to lay her eggs. The resulting wood powder is more meal-like than that of the lyctid, and it tends to remain tightly packed in the hole and feeding galleries of the larvae. Anobiid powderpost beetles are convex in shape and they pose serious issues for Pittsburgh industries. They are known to cause grave damage to beams, joists and other structural building components. Areas most vulnerable to an infestation are damp basements, garages and unheated out buildings. Unlike their two cousins, this group is able to digest the cellulose within wood, which allows them to attack and infest wood regardless of its age. This insect is its own anomaly, which is often the case with Mother Nature’s sometimes very strange and inexplicable creations. Below are 6 facts you may or may not know about the Powderpost beetle. These insects enjoy trees because they are the most direct means of access. Anything that is made of deciduous wood, however, can be a target including: toys; books; certain flooring and tools. The most common way Powderpost beetles are discovered is by means of the “shot holes” made by emerging beetles. These small openings, range in size from one thirty-second of an inch to one-eighth of an inch in diameter. Wood-boring Powderpost beetles spend much of their time as larvae and it can take up to five years for them to become mature adults. Like many other insects, these beetles undergo a complete metamorphosis. Powderpost beetles prefer deciduous trees to evergreen trees, and because of this, are known to survive extreme weather conditions. Their active infestation is primarily noticed in late winters through early summer. False Powderpost beetles, also known as “auger beetles,” can be distinguished from the real thing by the position of its head. The false variety has its head positioned downward instead of forward. Adult powderpost beetles fly toward and are attracted to light. They tend to gather around windows and lighted areas. 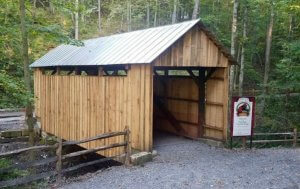 One recent invasion occurred in Jefferson County, Pennsylvania, at the historic Pine Bank Covered Bridge, for which we were called in to treat and effectively eliminate the infestation. Located at the Meadowcroft Museum of Rural Life in Studa, Pennsylvania, this edifice was built in 1871 employing a unique kingpost truss design. At the time of its construction, there were about 10,000 covered bridges in the United States. Today there are only 672. Originally situated overlooking Tom’s Run in the village of Pine Bank in Greene County, Pennsylvania, the passage of time took its toll on the timber-framed structure. In 1962, it was dismantled and moved 70 miles away to become an integral addition and attraction to the historic village where it now stands. Never adapted for use by modern vehicles, this bridge remains the only pedestrian access to the 19th century visitor area. In 1979, the bridge was listed in the National Register of Historic Places and more than 18,000 people, including 10,000 area school children, visit the site annually. Thanks to our chief Service Manager, Nick Vasko, and our team, this historic landmark will live on for generations to come. We’re a family-owned, pest control and pest management company that has been in continuous operation throughout Pittsburgh, PA since 1948. We were founded by a Lithuanian immigrant named Milton Zlotnik who originally operated the business from his home aided by his wife, Marion (Mimie), who also worked for the company. Originally headquartered in West Homestead and Braddock PA, Pestco Professional Services later moved to its current location in the RIDC industrial park. Milt gleaned a great deal of knowledge from his association with a well known and respected pest control expert named Arnold Mallis, a neighbor, friend and teacher, whose book, The Handbook of Pest Control, to this day is considered the ultimate authority on the subject of urban entomology. 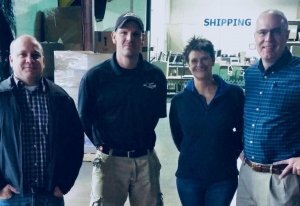 Over the course of the last seven decades, this highly reputable, five-star reviewed company has developed a stellar customer service reputation, and their emergency pest control services accommodate many high profile accounts within the Pittsburgh area and environs, including PPG Paints Arena, Heinz Field and PNC Park. 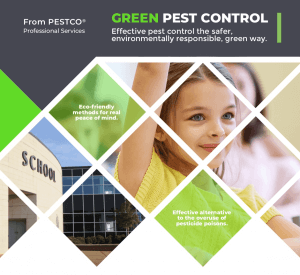 Among the many reasons commercial business managers and owners call on Pestco for all their pest control and pest management needs is the extra level of sustainable care that our Green Shield Certified X-Termi Green program offers. Our priority is the deployment of eco-sensitive solutions for all pest-related issues, which do not involve the unnecessary use of pesticides. Our concern for the environment and our carbon footprint has always been there, even long before such advocacy became a fashionable and politically correct stance. It should also be noted that we are the only commercial pest control and pest management company within the United States that manufactures the products we use and this has been the case since its inception more than 70 years ago. This advantage is possible largely because we have our very own 85,000 square-foot industrial science research facility located in suburban Pittsburgh. This commercial research hub is equipped with state-of-the-art advances that include the latest in: gas chromatography; mass spectrometry; headspace analysis; distillation; extraction and quality control technology. In addition to the most advanced and effective pest control strategies, we also offer professional odor control and restroom hygiene services within our all-encompassing program, Complete Facility Care. This three-pronged hygiene maintenance initiative is available to owners and managers of all types of commercial spaces located in Pittsburgh, western Pennsylvania, Cleveland and eastern Ohio and the West Virginia Panhandle. This expansion of coverage represents years of refinement and experimentation within the realm of industrial science to create and develop the most successful, comprehensive service package that money can buy. This unique plan offers participating companies superior pest control and pest management strategies deployed by highly knowledgeable technicians, washroom hygiene care provided by Enviro-Master, and environmental odor and air freshening solutions supplied by the ambient air-care masters at Air-Scent International. Ensuring healthy workplace environments, whether for a retail operation; hospital; university; showroom or gourmet restaurant, is a vital responsibility for all industry leaders. This vast array of incorporated professional services that are available under the cost-effective blanket of one company and one commitment to superior care are the easy answer to a busy company owner or manager’s prayer. Our Complete Facility Care Program takes the burden of delegating and supervising these types of services off the shoulders of stressed and overworked supervisors and onto those of professionals, leaving those in authority free to tackle the every day operations present in any commercial enterprise. Try these services once and you will never use another company to handle operational needs. Explore the possibilities and call our experts today (412) 252-5200.